RadChartView provides a crosshair functionality through the ChartCrosshairBehavior class. 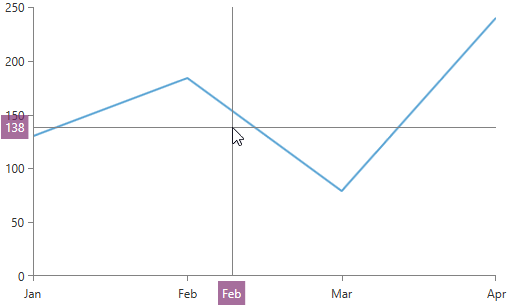 This behavior display vertical and horizontal lines across the chart's plot area that intersect on the mouse position. The lines are following the mouse position. The behavior also displays two labels (one for each line) which, by default, are moving along the axes, outside the plot area, following the lines. You can add the crosshair behavior in the RadCartesianChart’s Behaviors collection. The following code snippet demonstrates a simple chart definition that includes ChartCrosshairBehavior and it recreates the visualization shown in the image above. VerticalLineVisibility – gets or sets the Visibility of the vertical line. Data – an object of type Telerik.Charting.DataTuple. It holds the vertical and the horizontal value on the chart that corresponds to the crosshair position. Position – an object of type Point. It holds the position of the mouse relative to the chart. You can find a runnable project demonstrating the crosshair behavior in our GitHub repository, after navigating to ChartView/Crosshair.